They will know exactly what to say, exactly what to do, and now things are going to get a lot better for first responders living with the impacts of Post Traumatic Stress Disorder (PTSD), according to York Regional Police Constable Chris Price. Constable Price is a long-time member of the York Regional Police. Through his work, he focused on the difficult and disturbing file related to internet child exploitation and bringing those involved to justice. Over the years, he developed PTSD and, for various reasons, took quite a while to summon up the courage to seek help. 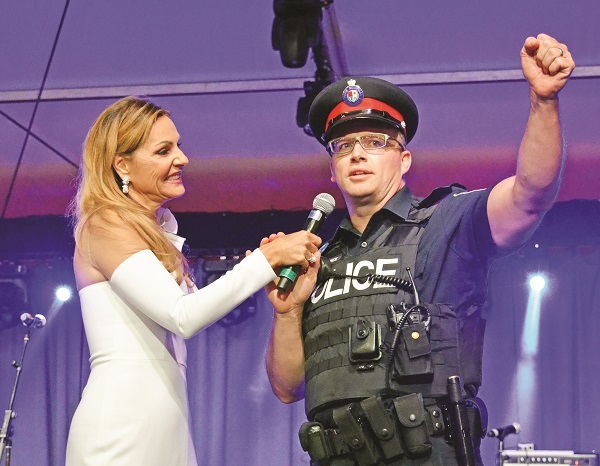 He shared his story with over 1,000 people on Friday night at the inaugural To Serve & Savour, a fundraiser benefiting Wounded Warriors Canada’s PTDS support programs. The event brought together five celebrity chefs who each brought their expertise to the table in preparing a small dish paired with a beer or wine. The event raised over $500,000 for the cause, the largest single fundraiser in Wounded Warriors Canada’s history. He thanked everyone for coming out to the fundraiser in support of Wounded Warriors and said all money raised will have an immediately positive impact on those experiencing what he lived with. To Serve & Savour was the brainchild of Jonathan Goodyear, Executive Chef at the Magna Golf Course, who batted around a number of ideas with York Regional Police Chief Eric Jolliffe, Steve Hinder of Magna for the Community, and five celebrity chefs, including Cory Vietello, Victor Barry, Rory White, Afrim Pristine and Jason Bangerter. Their savoury dishes, the beer and wine pairings, live and silent auctions, and music from the likes of police band Unknown Trouble, stage star Robert Pilon, and George St. Kitts, left the crowd satisfied on all fronts, including satisfaction in the knowledge that their support was going to have an immediate impact on those who need it the most. “I think it is important to add onto what Chris was saying, that the struggle that some first responders have coming forward with thinking they might have an operational stress injury,” said Scott Maxwell of Wounded Warriors Canada. “We raise funds and awareness to provide our mental health programs, which are saving lives across the country thanks to events like this. “This is everything. Without an event like this, there is no Wounded Warriors Canada. We’re 100 per cent privately funded. We’re in this together, and that is the mandate of Wounded Warriors Canada. This is about raising funds and awareness to provide direct programming, life-changing programs that would not be possible in this country were it not for events like this. Let’s face it; the need is real, it is across the country, it is for individuals, it’s for couples, families. When it comes to mental health, it is a complex issue. It is very individualistic and there is not one solution. Our view is to provide a spectrum of care that touches both individuals and helps the families and try to get as much funding into those areas as we can. When it comes to an event like this, you’re talking about significant contributions that will help.